When I bought my first juicer 4 years ago my fiancé and I juiced everything in sight for weeks. We went to Costco and filled our fridge with carrots, apples, beets, kale, oranges…you name it, we had a huge bag of it. Our fridge was bursting with produce. At first we had no idea what we were doing, but pretty soon we became pros at making awesome tasting juices. I mean, I even wrote a free eBook that has over 100 recipes! The only thing is, we knew the ins and outs of making juices taste good because of “flavor superstars” like green apple, ginger, lemon, and herbs like parsley, dill, and mint. These flavors are strong and add dimension to juice recipes which is great when making green juice but they don’t necessarily add a savory aspect. The thing is, we’ve never made anything all that savory juice-wise before. It’s so easy to make and drink a good green juice or sweet fruity juice for a quick surge in energy every day, but sometimes you want something a little different…something that has a real kick to it or that has that certain something on the opposite side of the flavor spectrum. Introducing 5000 Volt Juice! Sounds pretty intense right? Well, it can be but don’t let that deter you! I came across the 5000 Volt Juice several years ago on Youtube and I knew I had to make it. The ingredients just sounded too good not to try it, plus this recipe didn’t sound like it would taste like watery salsa….a huge plus! I don’t know how many times I’ve tried a recipe I found online somewhere for savory juice and wished I hadn’t. I mean, the recipes weren’t bad per se, but they just weren’t what I was hoping for; a delicious truly savory juice that didn’t rely on a tomato base (though that’s not a bad thing!). Instead I found a fresh juice that is both subtly sweet yet profoundly savory. It’s perfect in every way! I really hope you give it a try. This juice has so many layers of flavor – it’s got a delicious fresh orange undertone paired with savory red pepper and salty celery notes. Next comes the garlic (though not too strong) and a pleasant spiciness that follows. It’s darn good and is definitely one of my favorite savory juice recipes when I’ve got a craving for something different. 5000 Volt Juice really hits the spot- here’s how to make savory juice! • 4 good oranges (REALLY important) I’ve also got inkling that fresh ruby grapefruit juice would be awesome too! As with any juice, fresh great tasting produce is a must and I can’t stress that enough for this recipe. If you use oranges that lack good flavor then this juice will taste terrible. Be sure to try the oranges first! Also, be careful with the garlic. I have accidentally used a clove that was way too huge and the juice really just tasted like spicy garlic. Opt for a smaller clove of garlic for just the right pop of flavor. And again, choose to err on the side of less is more when adding your hot pepper of choice. It’s much easier to add spice than take it away and it would be such a shame to ruin such a delicious juice! If you need more spice simply add a dash or two of cayenne pepper. • Begin by preparing your ingredients for the juicer you have. I use this one. • Next, simply feed all of the ingredients into the juicer. 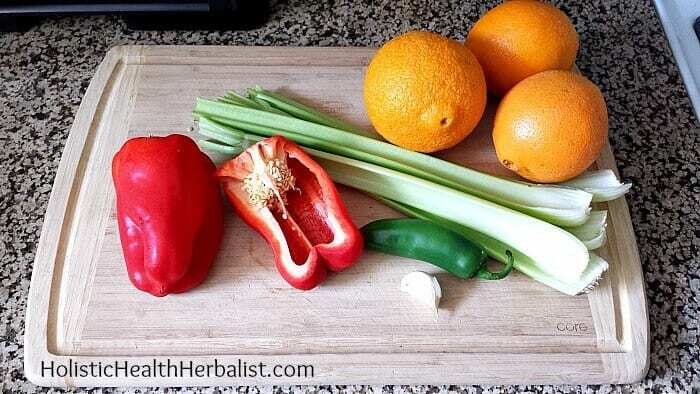 I usually alternate the celery with orange pieces to keep things running smoothly. Also, sure to add the garlic and the jalapeno to the juicer in the beginning! • After juicing all of the ingredients you will want to strain the juice. I have to be honest here, not straining a savory juice is just icky…trust me. • Pour into a nice glass, pop in a glass straw and enjoy! This juice is definitely better fresh, but in case you need to store it for later I would recommend putting it in glass mason jars and pop them in the fridge. You can also cover whatever container you decide to use with plastic wrap, just make sure it’s nice and sealed. An even better idea is to smoosh down the plastic wrap against the surface of the juice to prevent oxidation if possible, though this is a bit messy. Storing the juice in the fridge will give it about a 1-2 day “shelf life” so make sure to drink it sooner rather than later. I have saved some of this juice in past to enjoy later the same afternoon and I have to say that it just wasn’t the same. Compared to other juices I have made, this recipe loses flavor very quickly. HOWEVER! This juice is totally worth it! I hope you give savory juices a try as they’re awfully good! I went scouring the internet and found some really delicious sounding savory recipes for you to try. Have you ever made a savory juice? How was it? Really good job on the site, Thanks for guide! My wife love to cook so much, i will show her your blog. I really want to try juices but i don’t know where can i buy a juicer! I’m having this for breakfast for the first time right now. Delicious! My new favorite. Thank you.